This pasta dish—full of fresh vegetables, ground beef, cheese and bacon—isn't just better for you. 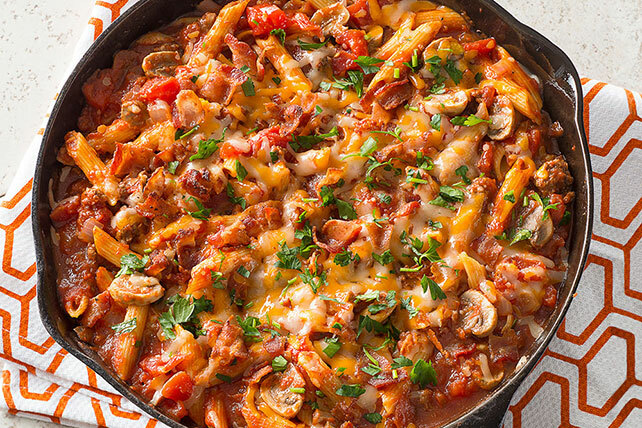 It's made in one pot, so cleanup's a breeze! Cook bacon in large deep skillet until crisp; remove from skillet. Drain on paper towels. Discard drippings from skillet. Add ground beef, mushrooms, onions and garlic to skillet; cook until meat is browned, stirring occasionally. Crumble bacon. Add half the bacon to meat mixture in skillet with the tomatoes, pasta sauce and water; mix well. Cover; bring to boil. Stir in pasta; simmer, covered, on medium-low heat 20 min. or until pasta is tender, stirring occasionally. Remove from heat. Top with cheese and remaining bacon. Let stand, covered, 5 min. or until cheese is melted. Sprinkle with parsley. Prepare using ground turkey or chicken, and/or substituting fresh basil for the parsley.